The new MARCO (MArket Research for a Climate services Observatory) Horizon 2020-funded project will address how climate services can better help fight and adapt to climate change. As climate risks grow, both companies and governments are increasingly facing the consequences. Tools, products, data and services that can help them either mitigate or adapt to climate change have the potential to drastically lower their impact. In this context, climate services have rapidly started to evolve in recent years, with an influx of many new providers and services. However, the market of climate services still remains in its infancy: current strategies face knowledge and visibility gaps, while the associated economic benefits to users are either unknown or uncertain. With in-congruent demand and supply currently plaguing the market, the EU has shown its willingness to invest in climate services in order to improve their match. Not only do service providers have a low degree of awareness and understanding of potential users, but many users say they cannot find data relevant to non-experts that enable them to make sound business decisions and plan for the future. An open, two-way dialogue that provides a clear value proposition for users and allows for the development of appropriate business models for suppliers will be a much-welcomed step in reaching this untapped market potential. MARCO will run for two years and involves 11 partners from six countries across Europe. Coordinated by the European Climate-KIC, it gathers market research firms, climate scientists, climate services practitioners and innovation actors to provide detailed insight into the climate services market in Europe. In addition to assessing this market, the project will carry out case studies, forecast future user needs, assess market growth until 2030, unveil opportunities, raise awareness and connect service providers and users. Finally, the recommendations made by MARCO to policy-makers may enable the creation of an EU climate services market observatory that will help monitor and evaluate the growth of the market. 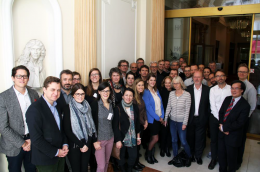 The project’s partners met on 22-23 November 2016 in Paris to officially launch the project and review the objectives and work plan. The first day of the kick-off meeting ended with a workshop to brainstorm collectively on the expected benefits and impacts of the project, as well as the key messages aimed at the different target audiences and stakeholders. The meeting on the second day was held together with MARCO’s sister project EU-MACS, which was also holding its kick-off meeting in Paris. EU-MACS will analyse market barriers and enablers, and look into opportunities and solutions, including the role of innovation and innovation policy in enhancing the use of climate services. Both projects will collaborate and support each other’s communication and stakeholders’ engagement efforts, and share the knowledge and insight gained during the project.